Indigenous North American cherries and blueberries wield the same powerful antioxidants and nutritional strengths as exotic superfruits. Tart cherries are available dried, frozen and in juice and concentrate. 95% of the fruits are grown in the United States. Long before exotic imports such as acai and pomegranate were dubbed "superfruits" and began turning up in everything from snack bars to cocktails and even lip balm, classic North American-grown blueberries and cherries boasted high levels of antioxidants, vitamins and minerals, among other benefits. What makes a fruit "super"? According to Wendy Bazilian, health expert for the Cherry Marketing Institute (www.choosecherries.com), Lansing, Mich., and author of "The SuperFoodsRx Diet," superfruits offer "health-promoting, disease-fighting properties" supported by research science. They also must have real, naturally occurring nutrients, including key vitamins and minerals to support health, and antioxidants. "But in order for them to be 'super' … they also have to be consumed," she says. In other words, they need to be easy to find and use, versatile and taste good. "Or else we wouldn't consume them frequently enough to reap their rewards," Bazilian notes. Take tart cherries — "an all-American superfruit, since 95 percent of those grown in the U.S. are consumed here at home," she says. They're available dried, frozen and in juice and concentrate, making them versatile and having a longer shelflife than fresh produce. "Tart cherries contain a unique package of antioxidants and beneficial phytonutrients, including anthocyanins — the pigments that give cherries their bright red color," she says. As if that weren't enough, tart cherries are naturally free from fat, low in sodium, high in vitamin A and contain a host of antioxidants. Blueberries are another powerful native superfruit. "At just 45 calories per 100g, or about 71 calories in a cup, wild blueberries are packed with antioxidants and deliver substantial nutrients for every calorie consumed," says Mike Collins, spokesperson for the Wild Blueberry Association (www.wildblueberries.com), Old Town, Maine. "They are naturally low in fat, high in fiber and have no added sugar, sodium or refined starches. They are also an excellent source of manganese, which is important for bone development." Also important, "Wild blueberries score 53 on the Glycemic Index (GI) scale, making them a low-GI food," Collins notes. "Consuming low-GI foods causes a smaller rise in blood glucose levels than consuming high GI foods — an important consideration for people with diabetes." And like tart cherries, wild blueberries are especially rich in anthocyanin — a flavonoid with potent antioxidant capacity that is highly concentrated in the fruit's deep-blue pigments and has powerful health protection potential. Tom Payne, industry specialist for the U.S. Highbush Blueberry Council (www.blueberry.org), San Mateo, Calif., adds that blueberries are low in calories and a rich source of potassium. And he adds the naturally occurring antioxidants, such as vitamins C and E, are "thought to help protect the body against the damaging effects of free radicals and the chronic diseases associated with the aging process." Then, of course, there's the taste. "With fruity, burst in the mouth flavor and healthy profile, blueberries give products lush taste, broad appeal and a clean label," Payne says. "They're a convenient choice for no-fuss ease of formulation, year-round availability and versatility in a multitude of formats." Today, traditional superfruits can be found in numerous food and beverage products. "From beverages and superfruit shots to convenient forms, such as freeze-dried, squeezable and portable fruit snacks," Bazilian says. "Trail-mixes — from simple blends to unique combinations of nuts/seeds and dried superfruits to spice- and herb-seasoned blends and cluster' — are making a real appeal to our taste buds. Beverages and smoothies blend a variety of superfruits to make portable, easy, sippable snacks or meal-alternatives." Additionally, she says, superfruits are being incorporated into salads and salad dressings, sorbets, frozen desserts and popsicles. Tart cherries, specifically, are available year-round in dried, frozen, juice and juice concentrate formats. Blueberries also can add taste, color and extra-healthy appeal in cereals, muffin mixes, jams and jellies, teas and juices, and yogurt, smoothies and ice cream, Collins points out. "There are constantly new products being developed that use wild blueberries as a key ingredient," he states. For example, you can find them in dried-fruit medleys at Starbucks and Jamba Juice, as chocolate-covered confections by Raisinets, and in energy bars from Kashi and other brands. Meanwhile, Payne cites some unique offerings: Coolish Drinkable Ice Cream, which is found in Japanese convenience stores and consumed by twisting off the cap and squeezing the nozzle right into your mouth; CremiXimo from Pasticceria Quadrifoglio — an aerated, pourable, low-fat ice cream that also can be used as garnish for fruits and baked goods, and for blending in cocktails; and drinkable gelatos such as Starbucks Sorbetto. "The Drinkable Dessert category is very big now, with product developers whipping drinkability into classics such as blueberry cheesecake, blueberry pies and even blueberry muffins," Payne says. Also finding a place in the current "bluetopia" are frozen cake pops, frozen cream cakes and blueberry Ice cream cakes, he notes. All indications are that supernatural natives themselves have a healthy future. 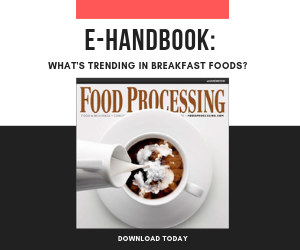 "Snacking continues to be a major trend and usage occasion for superfruits," which are ripe for use in developing new blends and flavor enhancements, convenient forms (bite-sized, snack-sized, portable) and fortified introductions, Bazilian says. In addition, "the sweet-tart profile of tart cherries is currently trending, with Americans citing greater preference for tangy (65 percent) and sour (31 percent)," she says, quoting Technomic research. As Collins reports, "wild blueberries are one of the world's most researched fruits." Twenty years ago, there were only a handful of studies published on the potential relationship between blueberries and health benefits, he says. Now there are more than 100 health-related studies released on this topic each year. Such research has led to new opportunities for superfruits. According to Payne, "The market for ingestible beauty (sometimes referred to as cosmeceuticals and nutricosmetics), food for the skin, is one of the newest areas — and a natural one for blueberries and blueberry products. These beauty-driven concepts are often associated with antioxidants. The use of fruit and fruit extracts, like blueberries, provides food for thought, positioning foods which boast antioxidants and other 'beauty-enhancing' ingredients in the forefront of the trend for 'eating beauty.'" Ultimately, he says, analysis of new product trends for 2011 shows that "'real ingredients" are the choice of today's consumers, from boomers to millennials" As such, classic superfruits will continue to prove powerful. Several consumer trends are driving the need to use fruit as an ingredient. You do not have to travel to faraway places to get your antioxidants.